ORADELL – Given the importance of the moment and the stakes riding on the outcome, Ramsey junior Maggie Carolan was remarkably calm. 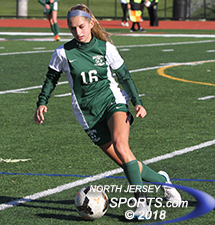 Locked in a tie game with Ramapo inside the final 10 minutes of the Bergen County Tournament semifinal round, Carolan had the ball at her feet, an open goal in front of her and a clear mind. Helene Tyburzy, a freshman, had just hit a free kick from the right side about 40 yards from goal and the ball’s flight pattern was a circuitous one as it rode the wind on a knuckling diagonal toward the second post. Ramapo tried to get it cleared, but the ball was knocked back in toward the goal where Carolan was standing with an unimpeded view. 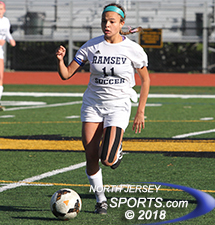 That goal with 8:58 remaining stood up to some late Ramapo pressure and gave Ramsey, for the second straight year, a Bergen County Tournament semifinal round upset of the second-seeded Green Raiders. This time is was a 2-1 victory at River Dell High School in Oradell. The Rams are heading for the county final for the second straight year where they will play top-seeded Northern Highlands, again just like last year. Emerson Elgin’s goal with 7:23 left in the first half drew Ramapo even at 1-1..
Last year Ramsey fell behind against Ramapo, drew even with 16 minutes left in regulation and then survived a penalty kick shootout to advance to the final for the first time since 2002. This time it was Ramsey that forced Ramapo onto the back foot with a goal just three minutes into the game. Alexa Correa took a short corner kick and then drilled it from distance across the face of goal and in to put the Rams up 1-0. Ramapo, the only team to beat Northern Highlands this season in an overtime thriller earlier this month and a co-favorite with a roster full of speed, got back even before halftime. Junior Mary Clare Langan sped up the right side and centered a pass to Emerson Elgin, the sophomore who has already committed to the University of North Carolina, for a tap-in goal that tied the game 7:23 before halftime. Katie Sylvester, Ramsey’s senior goalkeeper, did not get to take part in the festivities last season as she was diagnosed with mononucleosis right before the semifinal round. She made up for lost time on Sunday with two clutch saves in the second half. The first one came with the game still tied in the 57th minute when Nicky Chico drove the right, cut inside and, from a tight angle, got off a hard roller that tested Sylvester’s wickets. The keeper got to her knees in time to keep the shot out. Senior Alexa Correa got Ramsey on the scoreboard just three minutes into the game. The game remained deadlocked well into the second half, but it was not because the teams had retreated into defensive shells. Both sides, battling each other and the strong wind blowing steadily across the pitch, kept after it. Correa’s left-footed volley off a throw-in in the 69th minute ended just wide of the mark and it was Correa that was fouled to set up the decisive set piece two minutes later. Tyburzky, one of two freshman that are key pieces in Ramsey’s backline (the other is Maggie Haskell), struck the free kick that led to Carolan’s goal, but the real work was just starting as Ramapo went all out in search of the equalizer. The Raiders won a dangerous free kick from 25 yards out in the middle of the field, but it sailed high and wide in the 73rd minute and then Sylvester stepped to the fore again to slam the door. The clock had just ticked below five minutes when Ramapo’s Julia DiDomizio split two defenders and headed toward the middle of the field before rolling a pass into the path of Dani Zerbo, who picked up the ball as it slid past her and toward her favorite left foot. With a defender racing to make up ground, Zerbo had time to turn her hips and get her laces through. Zerbo cracked one from the edge of the area that was ticketed for the upper 90 inside the near post, but Sylvester went up and picked it out. It is Highlands next Sunday in the championship match, a 3 p.m. start at River Dell High School once again. Last year the Rams last 20 minutes before succumbing in what turned into a 5-0 defeat in the county final as the Highlanders won their sixth county title since 2011. This year has the potential to be different as Ramsey is a more seasoned group this time around even if it is still the decided underdog.